Here is the problem this creates: Your website was built with a purpose in mind. That might be attracting new clients, selling a product, promoting a service or maybe it’s a news site that relies on visitors and ad impressions. The point here is that when a new visitor lands on your site, there is something you’d like them to do. There is a lot of talk around the web about the value of minimalist design, the benefits of conversion optimization or how your most important information should be positioned above the fold. If you are publishing adverts on your site, it gets even more complicated. Less than a month ago the subject of ad-blocking in IOS9 came up and has since turned into a hot topic. Do people really want to see ads? Are desktop ads OK and mobile ads taboo? With so many opinions out there, how are you supposed to know which one is best for your site? For example, you might be thinking that a clean minimalist design is ideal for your news site. Maybe it is, but you’d also be interested to discover that the folks at Survivallife.com changed from a beautiful, clean design to a messy, information packed home page. Guess what happened? If you’re thinking that their metrics went downhill, you’d be wrong. Instead, the messy homepage resulted in an increase in time on page, total page views, and unique visitors. Regardless of which design path you head down, there is one thing that makes a difference to every design. Professionalism. A well-designed minimalist site and a well-designed site with two jam-packed sidebars can both look great. They can also both look horribly unprofessional. Choose wisely and invest time, money and energy where it’s important. Nobody cares about the volume of content that you produce. If you’re producing massive amounts of content simply because you believe content is king, there is a good chance you are throwing away time and money. Is content important? Sure it is. But only when it’s done right. Popular content and content that keeps visitors engaged and coming back has some specific traits that are worth taking note of. If you’re producing content that is helpful to your visitors, that’s a great start. If you spend a little time browsing through the Elegant Themes blog, you’ll notice a huge number of tutorials, reviews, and how-to articles. Almost every single article attracts comments and shares. Another type of post that does well is opinion pieces. Having an opinion in your articles virtually guarantees that someone will want to present a counter opinion. Good content is also easy to read. Using clear unambiguous titles, headlines and subheadings will help readers know where they should be spending their valuable time. Of course, don’t forget the importance of images either. According to HubSpot, articles with images receive 94% more views. Lastly, use a style guide. If every post on your blog uses different size images along with different heading sizes and fonts, readers won’t know what to look for and hey, it looks sloppy. Once you’re confident that the content on your website will engage your target audience, you’ll also want to make sure that it has a high probability of being ranked well in the search engines. If your content is easy to read for humans, it’s probably suitable for search engines as well. With that in mind, it’s also a good idea to make sure you implement consistent on-page SEO tactics to increase your odds of ranking well and attracting organic traffic. This is a subject that draws opinions from both camps. Primarily because if you’re creating awesome content that attracts a lot of comments, it can become very time-consuming to respond to each of them. That said, building a business of any type requires strong relationships and sometimes that begins by responding to the comment your readers leave on your blog. No matter how you slice it, people like to be recognized. By acknowledging their comments, people will feel more inclined to comment more. Like a snowball rolling downhill, the level of reader engagement will increase slowly over time. The benefits of interacting with your visitors in this way can include increased brand loyalty, more return visits and a better connection with your target audience. We all know that the money is in the list. And we’ve all heard about the demise of email. Whatever your opinion is on the matter, know that your ability to drive traffic back to your website is critical to your success. If someone visits your website once and fails to return, you’ve lost an opportunity. Collecting email addresses and communicating with subscribers is a great way of driving visitors back to your website and increasing engagement whenever you have something new to say. 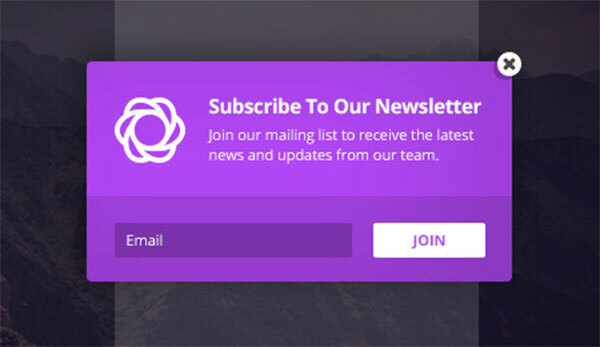 Using a plugin like Bloom will allow you to tie into all of the popular email marketing platforms and start building your list of subscribers. Sidebar opt-in forms are great but pop-up opt-ins convert better. Test what performs best on your site and stick with it. If you’ve decided to run with the awesome content idea that we discussed a few seconds ago, consider having an opt-in form at the bottom of each post or alternatively, a call to action. Internal linking is not only important from an SEO perspective but for site visitors as well. Frequent use of internal linking allows visitors to navigate your website more easily. Just as your post titles and headline (see how I did that?) are unambiguous, so should your internal linking be. If you’re going to point a visitor to a relevant article or piece of information on your site, never break their trust by sending them somewhere unexpected. As far as the types of internal links worth considering, your choices are plenty. A great place to start is from within your content. You’ll see this tactic used a lot here on Elegant Themes. If you have an opportunity to reference another post that might be capable of expanding upon your current topic, include a hyperlink and relevant anchor text. At the bottom of each post is a great opportunity to link to other relevant articles. While you could do this manually, there is also a plugin called YARPP (Another Related Post Plugin) that is worth taking a closer look at – not to mention the similar functionality found in the Jetpack plugin. If a visitor has taken the time to work their way to the bottom of an article, there is a good chance they’ll be interested in reading something that’s along the same subject lines. Finally, consider placing a list of your top posts or most-commented-on posts in the sidebar of your site. Visitors gravitate towards these lists and they’re an easy way to bump up your page views. As with internal linking, a simple and well-structured navigation structure will stop you from losing visitors unnecessarily. If you’ve ever been to a site where it seemed impossible to find what you were looking for, you’ll know exactly what I’m talking about. Nothing will frustrate users faster that lousy navigation. If your website requires scrolling, consider placing at least a partial navigation menu in the footer of your website. Again, this is about convenience and encouraging your visitors to click through to another page. Most WordPress themes these days are mobile friendly. You probably already know the importance of a site that keeps mobile users happy. A typical small business website these days is seeing mobile traffic surpass the 50% level on a regular basis. Catering to these visitors is no longer an option if you want them to stick around on your site. One thing in particular that is worth considering is the removal of nonessential elements for your mobile visitors. This might mean eliminating sidebars, ads or unnecessary graphics. You should also make sure that things like opt-in forms, calls to action and contact forms work properly across a variety of mobile devices. When these elements don’t work properly, visitors simply leave your site. Page speed is now an official Google ranking factor for the simple reason that visitors hate interacting with a slow website. If you want people to engage with your site, the process needs to be efficient and fast. If your website is slow, engagement will suffer no matter how great your content is or how well structured your navigation might be. One of the easiest ways to keep visitors engaged on your website is by taking a closer look at your analytics. With a little practice, you’ll be able to pinpoint not only the pages and posts that are doing well but also the ones that are having a negative impact. Some of the things you should look more closely at includes your top exit pages, the pages where visitors spend the least amount of time and which entry pages have the highest bounce rate. But don’t focus on just the bad news. If you have pages or posts that are performing unusually well, figure out why and do more of the same. If you review your statistics and discover that visitors are clicking through to your about page and then exiting, it should be a red flag. What can you fix or change on that specific page to reduce the exit rate? Solve potential problems and then measure the improvement. We’ve covered quite a few ideas in this post that are capable of boosting the engagement levels on your website. Many of the ideas are simple to implement but often overlooked. Having a site that’s user-friendly is always the first step towards keeping visitors engaged. Nothing will scare visitors away faster than a site that is slow or difficult to navigate. Producing great content is also important if you want visitors to return to your site with any level of frequency. Content that is helpful, opinionated and relevant has a greater chance of attracting and keeping visitors than if you’re just writing for search engines. At the end of the day, your objective is to keep visitors on your site long enough for them to decide to take the desired action – either making a purchase, contacting you, signing up for a newsletter or subscribing to a service. What specific engagement techniques do you use on your website? Are there any that you find work better than others? If so please share in the comments below. Hi Joe, my niche is Gadgets and smartphones and it has intense competition, with continuous flow of news topics. I first tried posting only news content as there was plenty of new launches and phone related news, but it’s not rewarding for long term. Now those old news articles show up as related posts which offers no value. In this case, how do I boost user engagement. Any tips would be very helpful. I think you should show new posts as related contents as it can really boost the number of pages visited per user and in turn reduce the exit rate that you can find in Google analytics. Do you have any recommendations on plugins to encourage shares and more interaction? I think you even used one tool on your latest raffle. Thanks for the tips, i think that creating post too like “How To”, will bring a lot of traffic, and optimize the codes for faster loading of the site, is something the user likes. Great reminder about the footer menu. I set it up for my clients but haven’t for myself. I found it while I was searching for a new theme for my new blog and it really helped me to increase visitor engagement on my website. Joe, perfect timing! One of my clients is an accounting firm and we’re considering a more messy site to attract leads. Great article, kind of bring back hope of blogging and making people stick around much longer without losing them via links that guides them out of your website. the article is right on, and thanks for continued great material and support, btw, your link to survivallife goes to digitalmarketer…. I very much agree with your point of view, the spread of social networking is also very important. Of course, the meaningful metrics will depend on what role your blog plays in your business (do you sell things from it? Or generate leads? etc. ), but those ones are decent enough to get started. I like your point about linking to popular or “must read” posts. Is there a way to do that automatically? I use Divi. There are options to display recent posts, but not “popular posts”. Thanks for a great article. You can display by category. So you might create an extra category for select posts called popular that only you use on the backend. Hi Susan, I’ve never used it but a quick google search brought me to this: https://wordpress.org/plugins/top-10/ — you can probably do some research and find a plugin that would work for you if that doesn’t do the trick. Thank you! I just saw this…great idea! i really like this post , and one thing i want to ask which part is major important on a website and blog for seo status. Regular ‘quality’ content and links from other popular sites in your niche is a good place to start.